Last year's images can be transferred to this year's site. This is especially handy for those elusive, camera-shy staff who always seem to miss Photo Day. Your image folders from last year's site must be marked for transfer. In your Image Library on the Categories panel, the numbered 'Year' button toggles the entire category for transfer to next year's book. Highlight the category to keep and click the 'Year' button. This marks those folders for use in your next year's site. 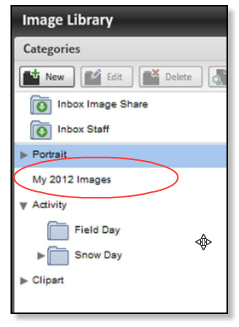 Since the button is always available, you can get a jump on marking those images for next year as you're sorting now. Open the folder labeled My [year] Images. The folder will be named for the previous year. Drag and drop the images from My Images into the new Activity category. Photos Marked "Do Not Use"
Do you have images in a transferred folder which are marked "Do Not Use"? These will be transferred to the new site AND "Do Not Use" will be removed from the image. Any names that are tagged on portraits do not move to the next year with the image. This is because the names are kept separately from the images and it's the images that are being transferred. Since most users will only be moving one or two portraits for those staff, they can be tagged with their name in the new job year.